Friday last week, I was in SM Mall of Asia Atrium for Kipling's 25th anniversary celebration. I seldom go to this place for a blog event, but I always make an exception if it's a fashion show. Upon registration, I was greeted by a number of Kipling fans playing the game Spot the Monkey, Kipling for Keeps and Pair it! where the lucky ones got to take home awesome prizes and surprises. 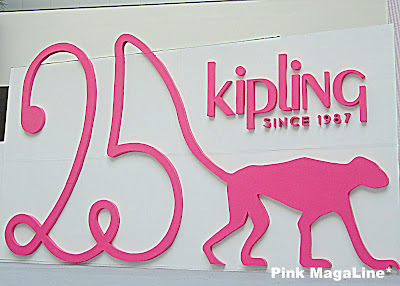 I love this pink stage backdrop for Kipling's anniversary celebration. The monkey with number 25 as its tail is cute. I should've went upstage to have a photo of myself using this as a background, but the program started as soon as I settled at the front row (right side). The event was attended by bag enthusiasts, fashion and lifestyle bloggers and some celebrities. Spotted were Patty Laurel and her fiancé Patrick Filart, Reema Chanco and boyfriend Erik Waldie (not in this photo), TV actress and fashion blogger Laureen Uy, and Anton del Rosario of Azkals. The cutest DJ, also MTV VJ, Andi Manzano hosted the show. In this photo, she's interviewing the two young girls from the audience. It was also her 25th birthday that day, same age with Kipling. What a coincidence, right? 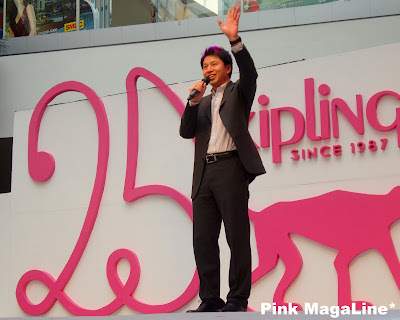 One of the people behind Kipling Asia, Kocher Lau, made a little talk about Kipling and its succes. After which, we feasted our eyes on the parade of colorful and stylish Kipling bags for Spring/Summer 2012. Check my separate post HERE. Patty Laurel wearing a beautiful floral maxi dress with fiancé Patrick Filart. I wonder when are they getting married. They look so bagay na bagay! The sporty couple Reema Chanco and boyfriend Erik Waldie. Are these two getting married too? Hihi. A photo op with Andi Manzano after the fashion show. I love her aquamarine jeans so much. Very summery. Top fashion blogger Laureen Uy of Break My Style, one of the most in-demand bloggers in the Philippines, and footballer Anton del Rosario of the Philippine Azkals posing for the camera with their Kipling bags. My last photo op before leaving the event location. Isn't it obvious in my photos that I was wearing flats that day? Special thanks to the PR of Kipling Philippines for inviting me to this event. Happy anniversary Kipling. More monkey years to come!!! Andie Manzano is sooo pretty! I like her aquamarine jeans too. You are lucky to have photo opp with that Azkal guy sis, hehehe! Hmm.. Ano kaya ang brand ng lipstick ni Laureen Uy? Ako sis, won't you ask which brand of lippy I was wearing that day? Hihi. Yeah, feeling lucky to see Anton again. I saw him like in RWM before pero di ako nagpa-picture kasi sobrang daming tao sa event na yun. Uy sis pareho kayo ng shades ng lipstick ni Andi M at Laureen Uy! hehehe! ayay! such a great opportunity to be part of the event...good for you sis! A lister ka talaga...love your top btw! Hindi naman sis. Just got lucky to know someone connected with Kipling Philippine. Her fair skin gives her a beautiful glow. So cute nga eh. If you are planning to buy another Kipling bag soon, just text me so I can give you my discount coupon sis. it was nice to see you sis.. i love Anton and his bag too..